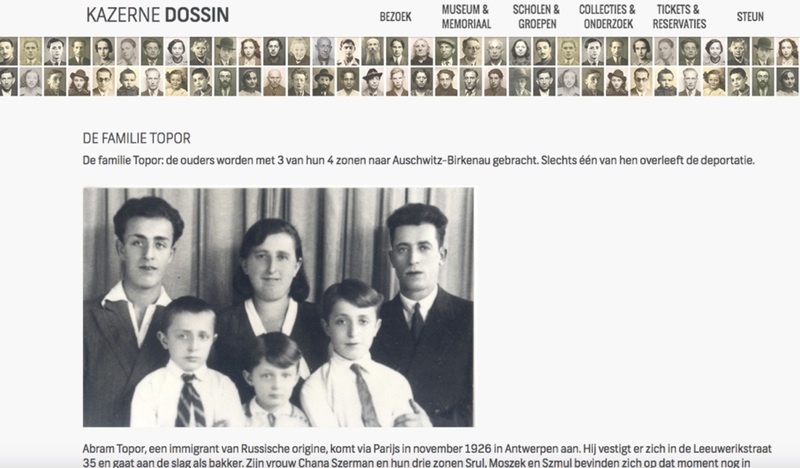 To commemorate the 75th anniversary of the deportations to the East from the central assembly camp in Belgium for Jews, Roma and Sinti Kazerne Dossin started a series of online publications to mark these events. Around the date of departure of the convoy two personal stories per transport were written to lift the historical facts beyond the numbers and bring to live the victims and their stories and their tragic fate (https://www.kazernedossin.eu/NL/Overzicht-Transporten). The series and the format in which they were timed led to a renewed understanding of the magnitude of what happened, especially in the summer of 1942 when in a couple of weeks time, thousands of people were physically removed from Belgian society and put on trains to be killed. Indeed, between 4 August and 31 October 1942, in less than three months time, 17 transports left the Dossin barracks with on board in total 16,631 Jews. The writing, publishing and reading of the story of two deportees of each of transports – especially on the first 17 leaving on 4, 11, 15, 18, 25 and 29 August, on 1, 8, 12, 15 and 26 September and three double convoys on 10, 24 and 31 October of the year 1942 – is simply overwhelming. In this contribution, we explain our main source on the deportation of Jews, Roma and Sinti to, mostly, Auschwitz-Birkenau: the Transportlisten. 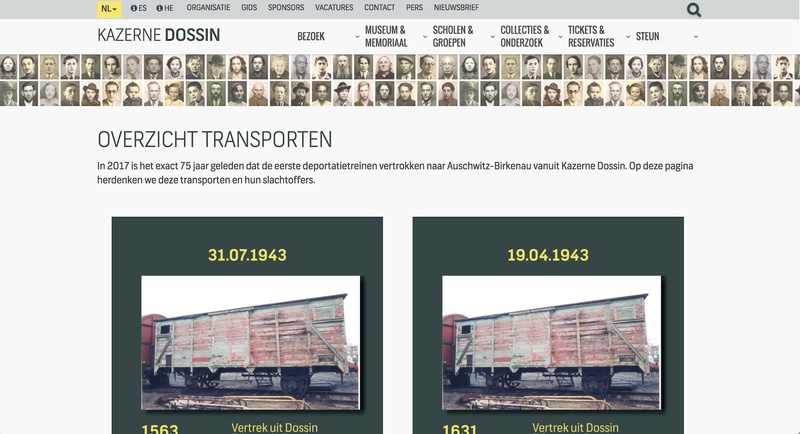 We consequently give an overview of the deportation trains leaving Belgium and conclude with linking this information with the personal life stories as mentioned above and how the latter project brought in a new and painful understanding of time and magnitude of this fast removal of thousands of people from Belgian society. 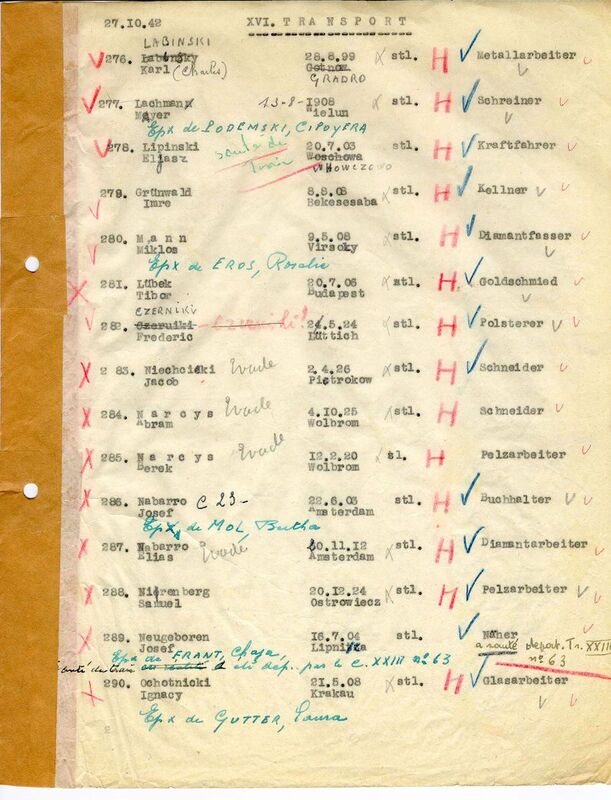 The Transportlisten, the original German deportation lists, result from the systematic registration of future deportees upon their arrival at the SS-Sammellager für Juden, the assembly camp for Jews at the Dossin barracks in Mechelen (Belgium). The original deportation lists are part of the collections of the National State Archives / Archive War Victims and were made visible online together with names and photos of deportees by Kazerne Dossin in the Beeldbank including an introduction on the digital image bank. 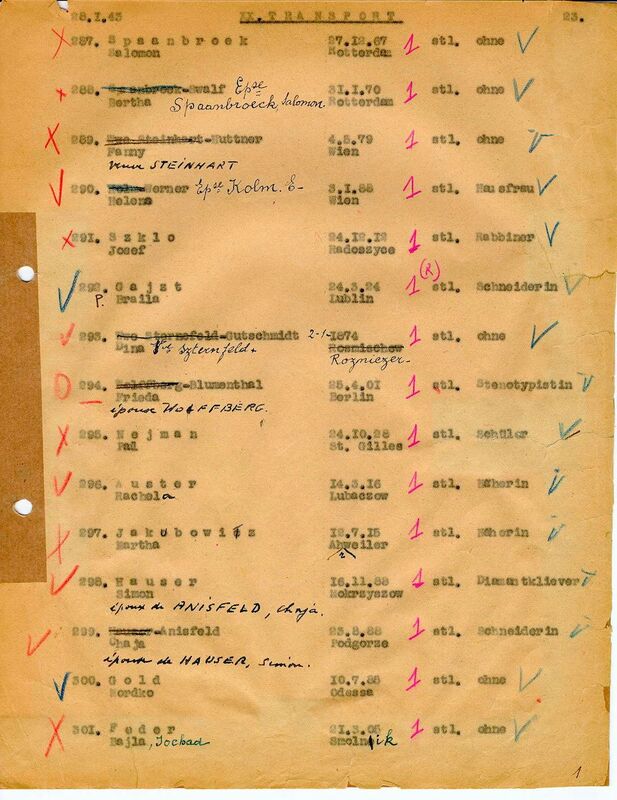 Young Jewish women working under the orders of two German SS men, Max Boden and Rudolf Steckmann, typed this list at the Aufnahme, the registration office of the camp. On July 27, 1942, the day the camp opened, the Aufnahme was not yet fully equipped, but soon a whole registration procedure was put into place, documenting the first summoned Jews. Upon arrival at the camp, a Jewish detainee assigned to the Aufnahme distributes an identification plate to the newcomers, on which their registration number on the Transportliste is mentioned, as well as the place they would occupy in the deportation trains. The Transportlisten are drawn up in at least four copies: a list is sent to the Sipo-SD in Brussels, the second remains at the Aufnahme, the third is given to the train attendants and the fourth is sent to Berlin. The documents Kazerne Dossin has at its disposal today are probably those kept at the Aufnahme. Transportation lists are essential documents for reconstructing lists of deportees as well as for establishing the history of the deportation from the Dossin Barracks. Jewish workers from Belgium, summoned for obligatory labour in northern France for the Todt Organisation, since June 1942 were registered for deportation in the camps in northern France themselves. From 27 to 30 October 1942, Commander Philipp Schmitt, his subordinate Karl Meinshausen, and other SS men accompanied three Jewish employees of the Aufnahme of the Dossin barracks to these various camps: “The SS took us to Boulogne-sur-Mer or somewhere in the region to register the Jews of the Todt Organisation. On that train too, the SS were watching us. It was October 1942. We were accompanied by three SS in the room. We were staying in Paris-Plage or next door, in a disused hotel. Around, everything was deserted, we saw houses destroyed, empty, probably an evacuated place.” Exceptionally, these Jewish deportees did not pass through the Dossin barracks. Coming directly from France, their train stopped at Muizen station. In Muizen, a suburb of Mechelen, the Aufnahme employees left the convoy and returned to the camp with the SS men. The train halted for a few hours in Muizen, while Jews enlisted for this convoy from the SS-Sammellager were forced to embark into train wagons to complete the convoy. The departure took place on October 31, 1942, very early in the morning. Inside of the assembly camp Dossin, some Jewish partisans from Brussels started preparing their attempt to escape from the deportation train. They tried to be assigned to the same train wagons, preferably surrounded by deportees who would not prevent them from jumping, or even with people who may join the escape. For this purpose, they exchanged their identification plates and changed their registration numbers on the Transportliste. When asked, the Jewish secretary responsible for typing lists agreed to falsify some pages of the document. Consequently, the dates of the internment of several deportees do not correspond to the day of their arrival at the SS assembly camp. 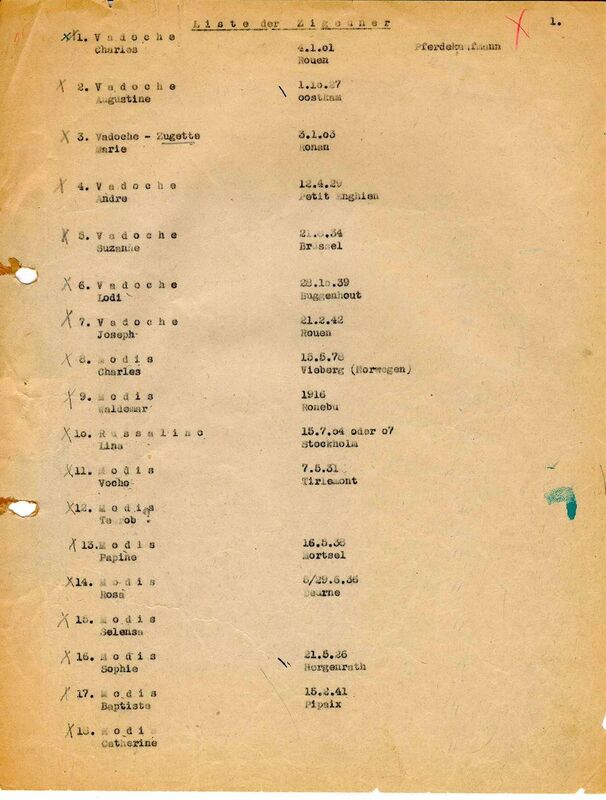 The original German document contains the names of the 351 Roma and Sinti, deported on 15 January 1944 from the Dossin barracks. While Jewish prisoners were registered on the deportation list by the Jewish secretaries of the Aufnahme, this was not the case for Roma and Sinti. Exceptionally, two Kripo employees and two typists were specially sent on certain days to Mechelen to make this list. 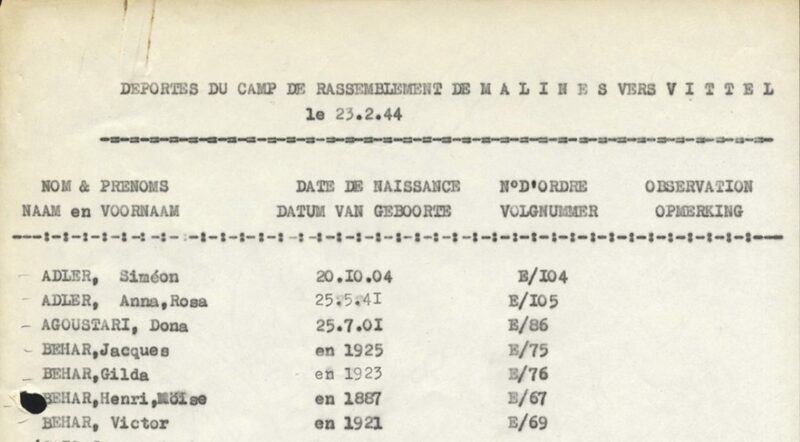 Consequently, the dates mentioned on this deportation list do not systematically match with the day of the arrival of the Roma and Sinti at the camp in Mechelen. The dates on the list vary between 5 November 1943 and 12 January 1944. For 35 of the first 36 registered, no date is mentioned. 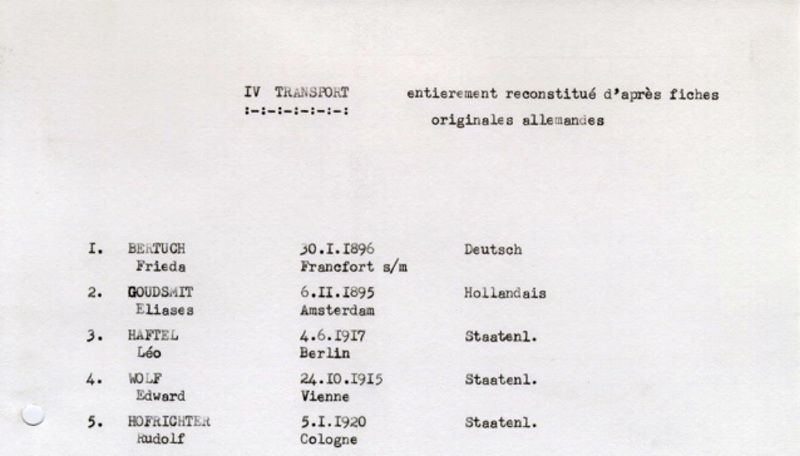 The lists are typed out transport by transport, the numbers of the deportees are given in order of arrival at the Aufnahme, the registration office in the Dossin barracks. The pages are numbered in the upper right corner. 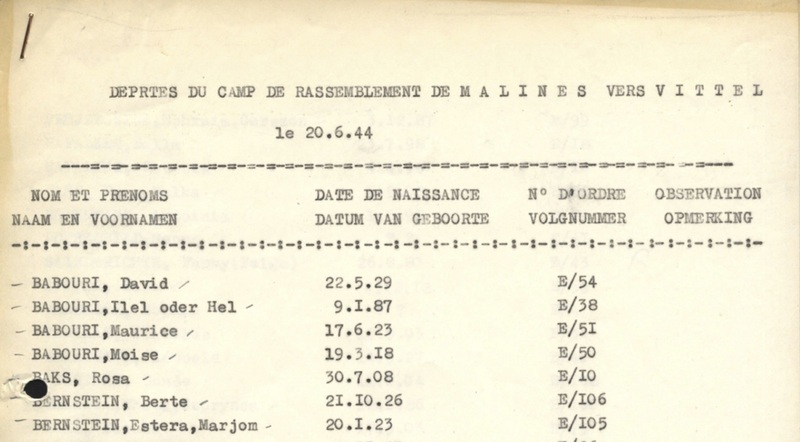 After the war, the Ministry of Reconstruction and Repatriation used the original Transportliste to trace the fate of the deportees from the Dossin barracks. The officials of this service provided numerous handwritten annotations on these documents.Data such as surname, first name, places or dates of birth have been corrected. 0ften, spouse’s names or addresses have been added. Information has been added to the lists if the deportee jumped out of the train. Escapees are indicated in various ways: “évadé” [escaped], “sauté du train” [jumped off the train”]. Officials also often indicated whether the escapee had been shot or re-arrested and, if so, by which transport he was deported. Information has been added to the lists when the deportee’s repatriation is certified. The names of returnees are accompanied by a “P” [probably: Present], an “R” [Rapatrié] or, more rarely, a “vivant” [alive] mention. The deportation lists of transport IV and special transports are lost. These documents, written in French, have been reconstituted on the basis of the SD File. Their appearance is quite different from the original documents. 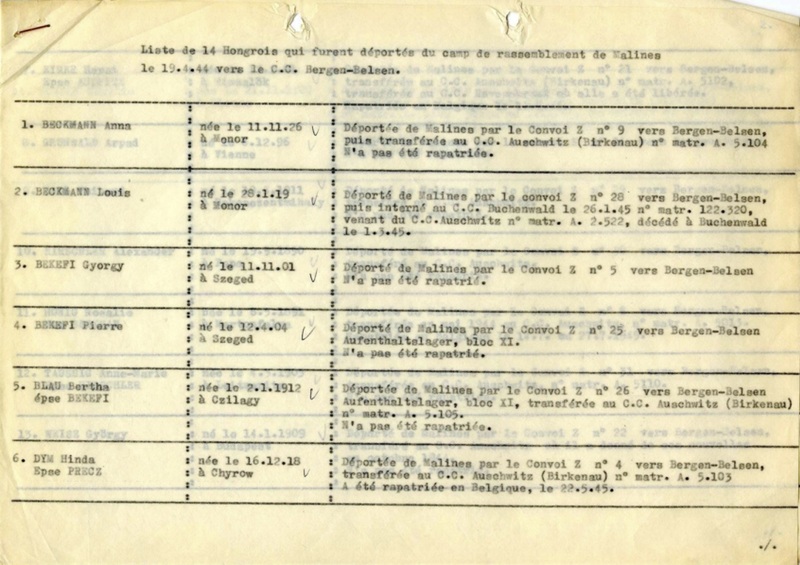 On the deportation lists for transports Z to Bergen-Belsen and E to Vittel, the numbering is not consistent. This is the first Sondertransport [Special Transport] which left the SS Assembly camp Dossin. The 64 women and children were disembarked at Ravensbrück. The 68 men were deported to Buchenwald. The meaning of the “Z” letter is unknown. Fourteen Jewish Hungarian deportees on this Sondertransport [Special Transport] were sent to Bergen-Belsen. “E” means Entscheidung [Decision], what means that the Jews on board were transferred to the internment camp Vittel, because of their particular nationalities (American, British, Swiss, Haitian, Bolivian…). On the lists of transports E to Vittel, people are not identified by numbers. Telephone interview of Eva Fastag-Dobruszkes by Monique Heddebaut, 26 December 2005, validated by correspondence of 18 January and 26 February 2006. “In 2018, visiting from the American Society for Public Administration, International Chapter subsequent to community integration visits to the former Czechoslovakia (the Czech and Slovak Republics) circa 1991”. During the Ministry of Health meetings, David Towell of King’s Fund of Great Britain and Julie Ann Racino of Syracuse University, USA also toured the Holocaust Historical Monument. Community integrationists (See, wikipedia) in the USA are now often termed inclusion and affiliate with organizations such as Inclusion International and Inclusion Canada-Europe-USA. Julie Ann Racino (3rd generation Polish-American, grandmother-babci from Vilnu, Poland) authored and edited a new book, Public Administration and Disability: Community Services Administration in the US (Racino, 2014) at http://www.crcpress.com/author. Square Market/Community and Policy Studies features a brief report with references on the visit (2014) and the prior one to the United Kingdom. The US has a new Holocaust Museum! !